Omar’s Place is so brand new the ovens have barely had time to heat up, but somehow it feels like it’s been there forever. 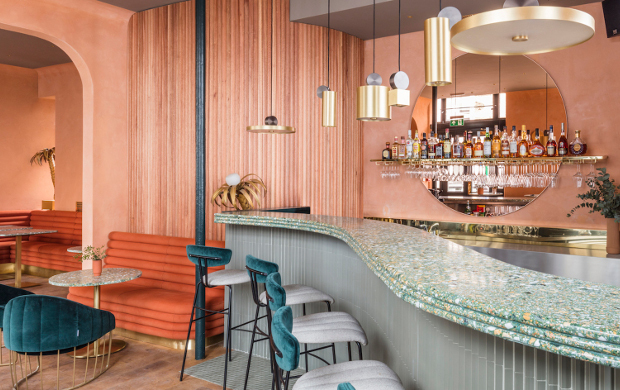 Tucked down a Pimlico side street, and the shortest of walks from Victoria station, this small-plate eatery is a casual, bustling and thoroughly tasty ‘local’ with more than a touch of Mediterranean charm! The eponymous, Egyptian-born Omar (Shabaan) himself comes from a family of restaurateurs and hoteliers (in Egypt the Andrea Mariouteya hospitality brand, a mini-empire of restaurants, bars and boutique hotels which Shabaan oversees, has been in the family for 60 years). But he has long dreamed of bringing a flavour of the Mediterranean—a place as lively and vibrant as it is refined and delicious—to the London he loves so much. And with Omar’s Place he has done so with aplomb! With a vaulting ceiling giving the illusion of space, and muted terracotta walls bringing some Mediterranean warmth, it is a surprise that Omar’s Place in fact has room for just 36 diners. Though flanked on one side by an elegant bar, the small square tables give it the illusion of a café rather than an elegant eatery. But one suspects that casualness is designed to be part of the appeal. Nothing about Omar’s Place is stuffy; from our ebullient waitress to the paper menus, everything feels designed to put you at ease rather than impress. Crowd is the right word! At 6pm on a Thursday night it looked for the first 30 minutes like we would be dining alone, but before our first course had arrived we could see dating couples, friends catching up over cocktails, large groups of work colleagues and even the odd lone diner. And by nightfall Omar’s Place had turned into the sort of low-level bustle you’d associate more with a trendy bar than a relatively small-scale restaurant. In short, minus a few kids running around (a minus which I’m always a touch grateful for) Omar’s seems to cater for everyone (in fact, if rumour is to be believed, only recently the restaurant was rented out privately to middle-Eastern royalty)! The vibe was young (but not exclusively so), trendy and professional, and chatting to people it seemed that most of the customers were indeed locals, which lent Omar’s Place the feeling that you’d happened upon an undiscovered gem. If Omar’s Place has a definite trump card it’s the food. When you think of tapas, I’m inclined to think rustic (possibly swimming in oil and occasionally as much of a miss as a hit) but there is nothing rustic about these elegant plates. And there were definitely only hits! 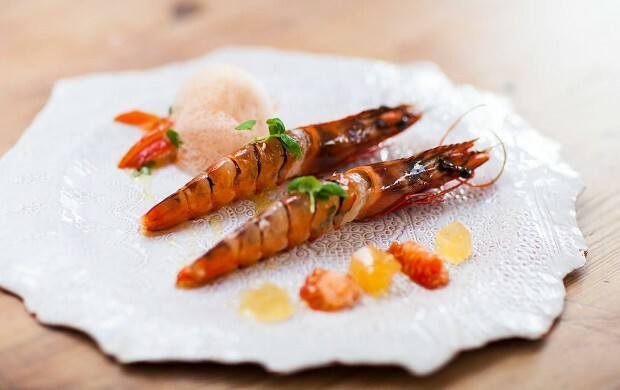 As recommended by our (charming and infectiously good-humoured waitress), it’s best to choose one plate per diner from the Cold Tapas, Hot Tapas and Mains menu with the addition of a side or two (though I could happily have ordered far more). What’s on offer is a fusion of all things Mediterranean, whether it’s the smoky meats of Spain, the fresh fish of the Italian coast or the deep spices of Morocco, there should be something for every palate. We were thoroughly spoilt by our cold tapas selection; light yet flavoursome Iberian Ham Jotas (£18) with manchego cheese and tomatoes on crispy bread (and the inventive addition of olive oil ‘spheres’), delicate and meltingly soft Squid Tartar on lemon with sea water foam (£8), and Foie Gras beetroot meringue with mushrooms (£12) which—despite initial reservations from this critic—was honestly one of the most incredible and inventive things I’ve eaten in quite some time. The hot tapas that followed were even more wonderful; Egg parcels (£9) of crispy potato filled with a liquid egg yolk, jamon, chistorra and truffle were melting mouthfuls of heaven, and seared garlic and chilli Gambas Al Ajillo (£12) were the softest, sweetest prawns I think I’ve ever eaten. The roasted quail main, stuffed with aubergine and quails egg (£17), was a sticky soft treat, but the salty, lip-smacking delight that was my order of Iberian pork shoulder (£14) was so delicious I almost couldn’t bear to share. If you’re feeling full after all that decadence the surprisingly light Limoncello-flavoured baba with vanilla cream (£7) should take the edge off. And although I’m not sure a chocolate fondant (£6) is exactly Mediterranean, it was such a dark delight I’m not complaining. As delivered by frighteningly young, and impressively talented head chef Rosanna Vittoria, the food at Omar’s Place deserves more praise than I can adequately level her way. But I will say I’ve eaten Michelin-starred food less impressive than her menu; if you appreciate exquisite ingredients, lovingly handled (and a small flair for the unusual), Omar’s is the place to eat. The cocktail menu is small but perfectly formed (not to mention very reasonably priced), with a couple of Mediterranean spins on the classic espresso martini and the Old Fashioned, and I can certainly recommend the sweetly refreshing Pimlico bellini (£8) of pomegranate juice, limoncello, grenadine and prosecco. There is also is an excellent wine list of largely Mediterranean tipples, and our bottle of Sardinian Cannonau I Fiori went down extremely well. It should be noted that Omar is a whisky man, so you’ll also find a more than usually large selection of those behind the bar! With a bustling but laid-back ambience, staff who are as friendly as family, and a menu that is at once exotic but homely, elegant but unstuffy, and thoroughly, undeniably delicious, Omar’s Place may be the perfect Pimlico local. If you would like to stay up to date with our restaurant reviews, subscribe to our weekly e-newsletter.